I had an idea for a shirt after looking around on Pinterest last night. It was so cute. 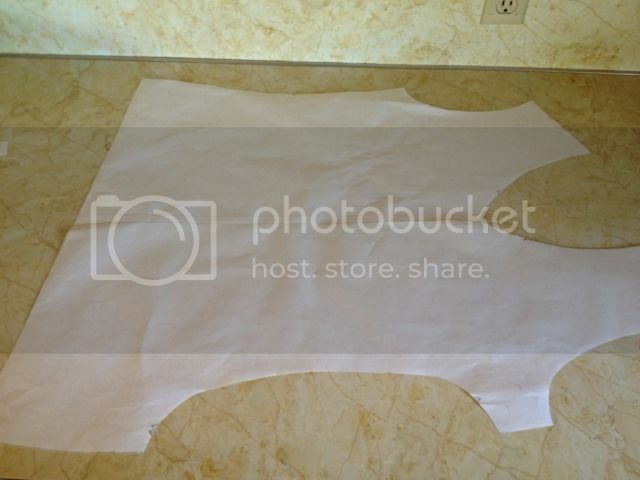 It had a side cut out that was then gathered or ruched to the side of the cut out. Here's how my pattern turned out. Excuse the curtain and toe, I never promised to be a professional photographer. Would you like to know how I altered the pattern? 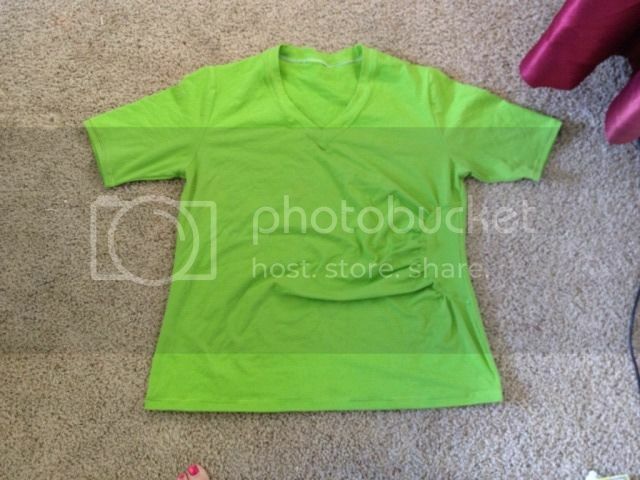 Well for starters I picked one of my favorite basic tee shirt patterns. This one happened to be Jalie 2805. 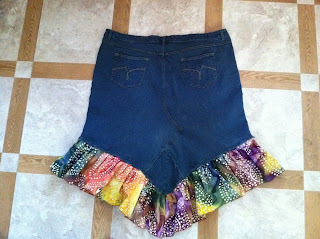 I love their patterns because I can make them from kid size to adult size all from the same pattern. 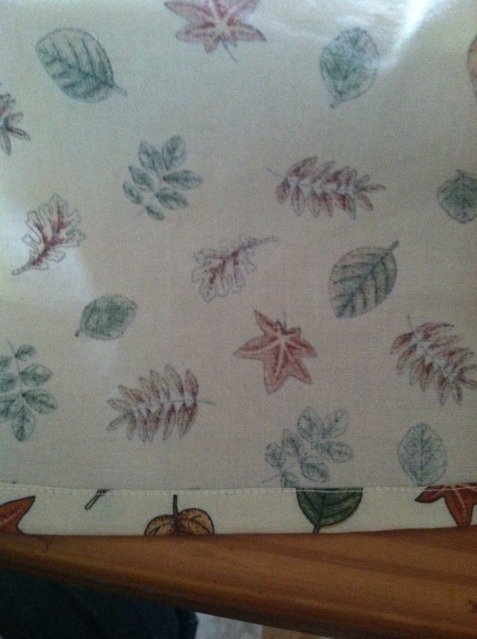 I used view C here only I lengthened the sleeve. I like my sleeves to hit just above the elbow. 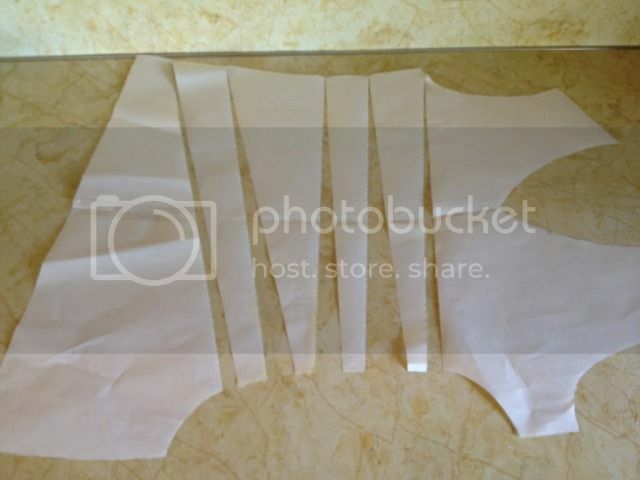 Trace your pattern off marking where you'd like the side cut out to be. 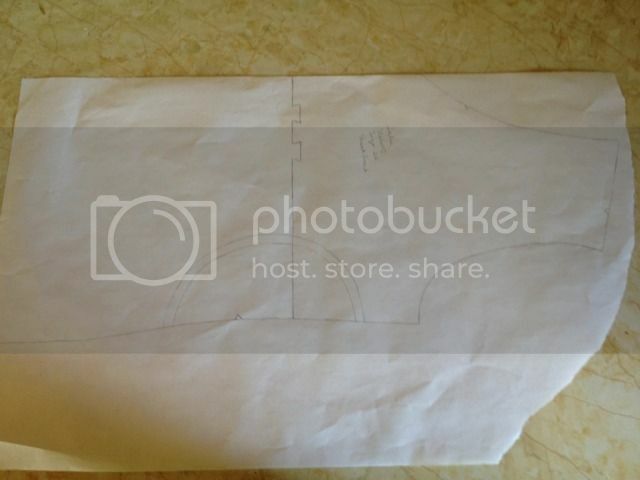 I didn't want to cut my base pattern (just in case I want a plain tee shirt later) so I retraced it on to two sheets of freezer paper taped together. 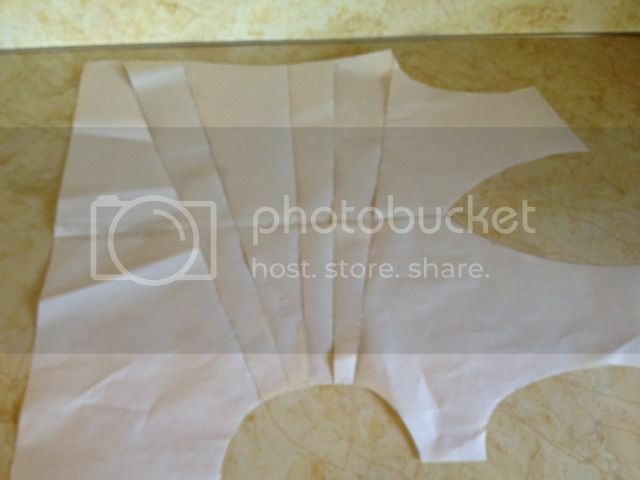 If you choose to cut your base pattern, you can just tape another sheet to the center front of the shirt so you have a full shirt front. It's very important to have the full shirt front at this point. 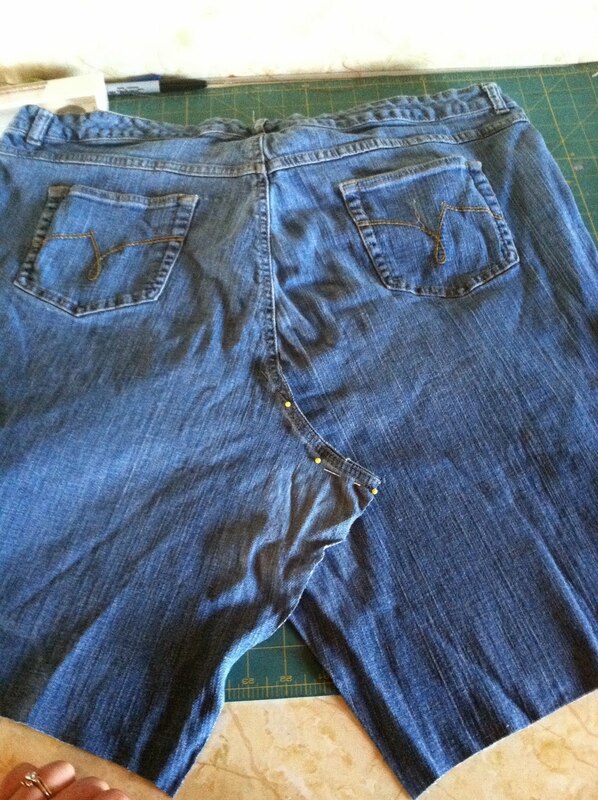 Also add a seam allowance to the cut out at the side. You need to draw diagonal lines into your front and carefully cut them from the cut out, to about 1/4" from the edge of the left side. 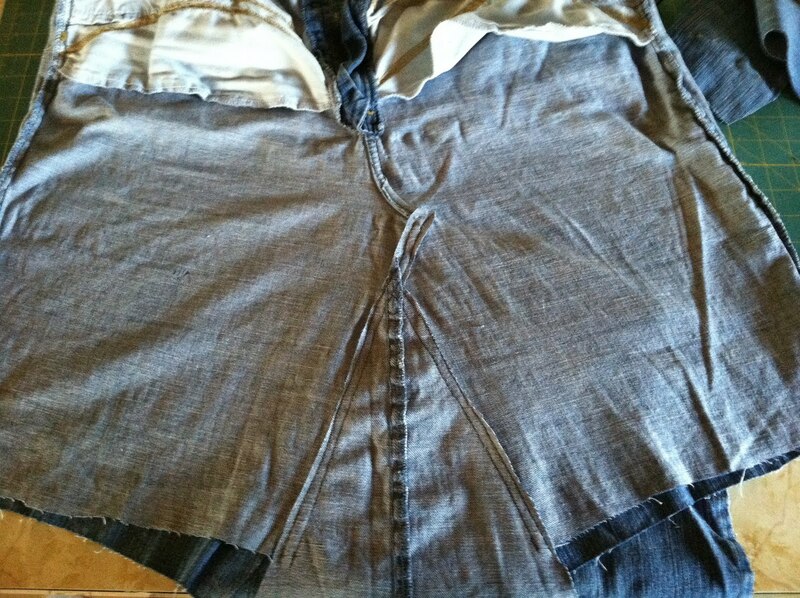 Next, decide how much ruching you would like for your shirt to have and carefully spread the slits apart. Try to keep them even. 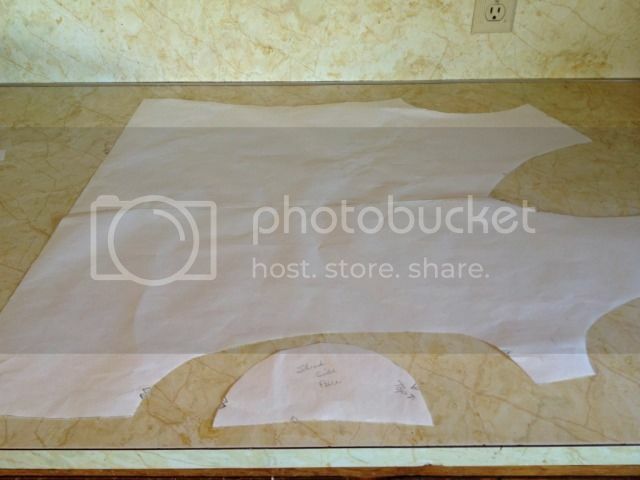 At this point you will need another two sheets of paper to retrace the top following the curve of the cut out. This is what your final pieces should look like. 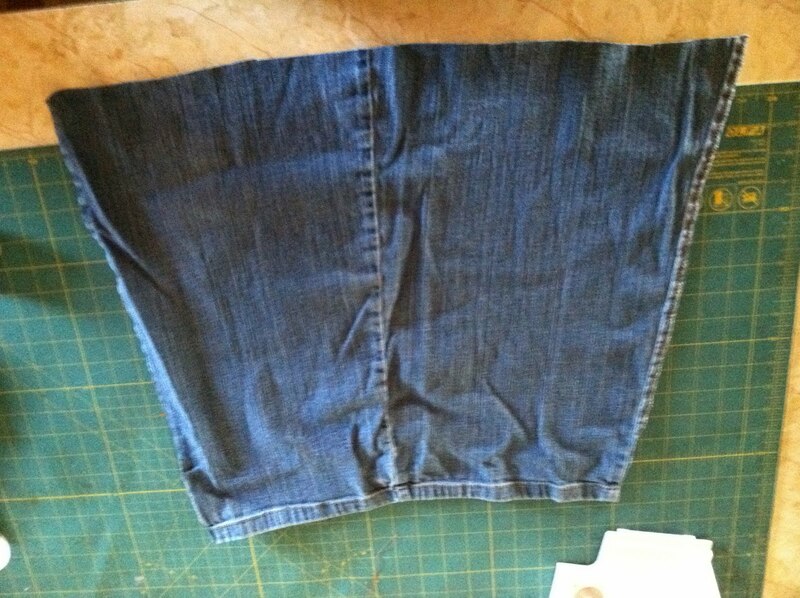 I added notches at the top and bottom so that when I cut from my fabric there wouldn't be any confusion when I line the two pieces up to sew them together. 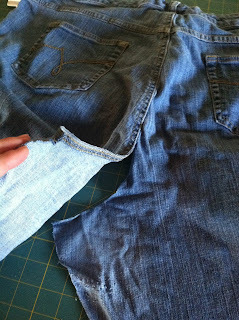 Don't forget to add seam allowance to each cut out edge. The longer (bodice) piece is gathered to the smaller (side) piece when you sew your shirt together. Questions? Ask away. 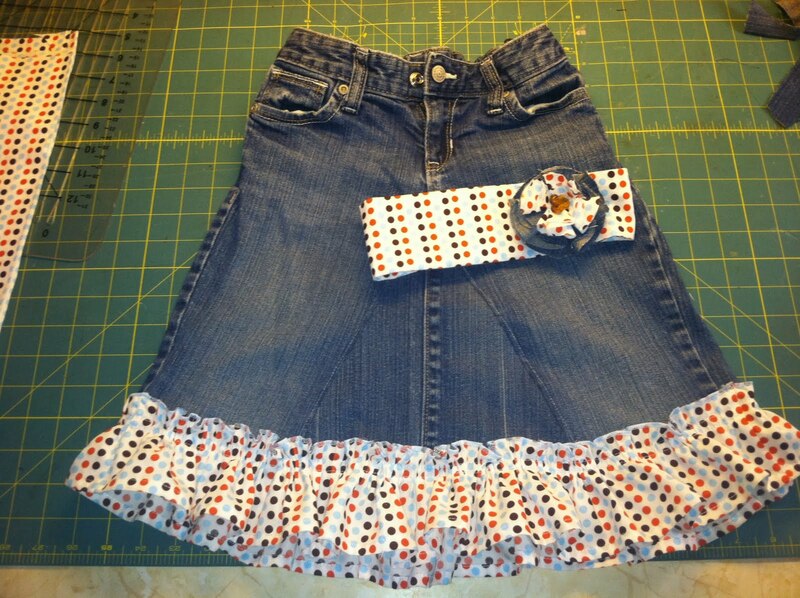 :-) Happy Sewing! I'm laying here, the night before your 8th birthday wondering how the precious time moved so quickly. Tomorrow you will be baptized and confirmed a member of the church. I just can't believe that you grew so quickly. We've had some highs and lows. You have always been such a sweetheart. I'm so glad the doctors were able to help you hear better. Thank goodness we had a doctor that finally listened to mommy. Sometimes mommies really do know what they are talking about. You are such a princess. You always have been. I want you to know that we love you. I'm so excited for you as you take this next step in your life. Always remember to smile my sweet child. 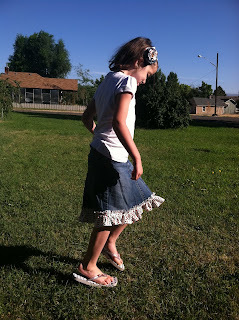 I saw this tutorial the other day and new instantly that it would be a hit with Abby. 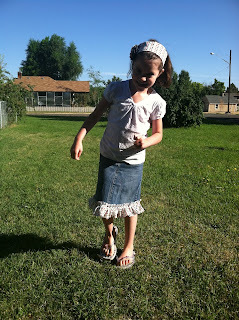 She needed a shirt to go with a skirt that I made for her last week using my reconstructed denim skirt tutorial. The only thing I did differently is I serged the edges with a roll hem stretching as I sewed so that it would make it ruffle. We are both really pleased with the end product. Things you need: A pair of jeans that fit, sharp scissors, pins, heavy jeanstitch or topstitching thread, denim/jean needle, and of course a sewing machine. First thing is to decide where you want to cut your pants off at. 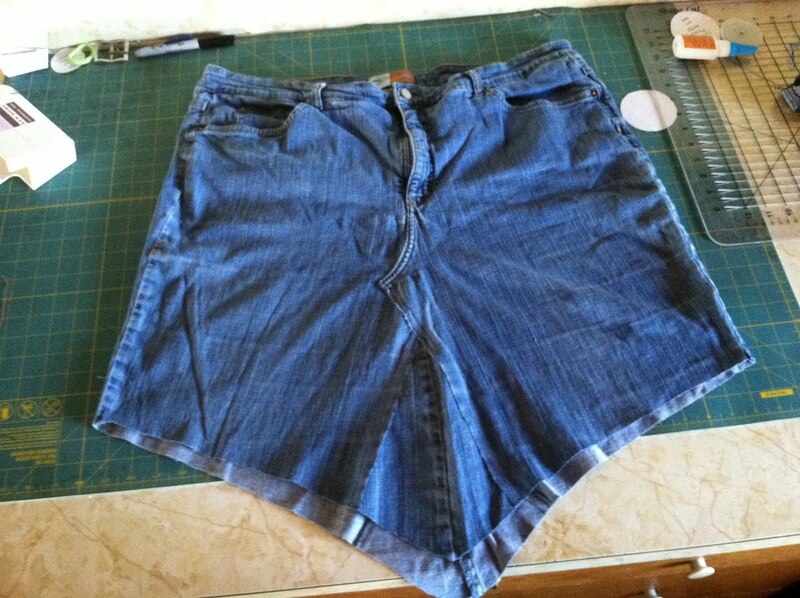 I decided I wanted mine cut off at the knee. I plan on adding a ruffle or something to the bottom. 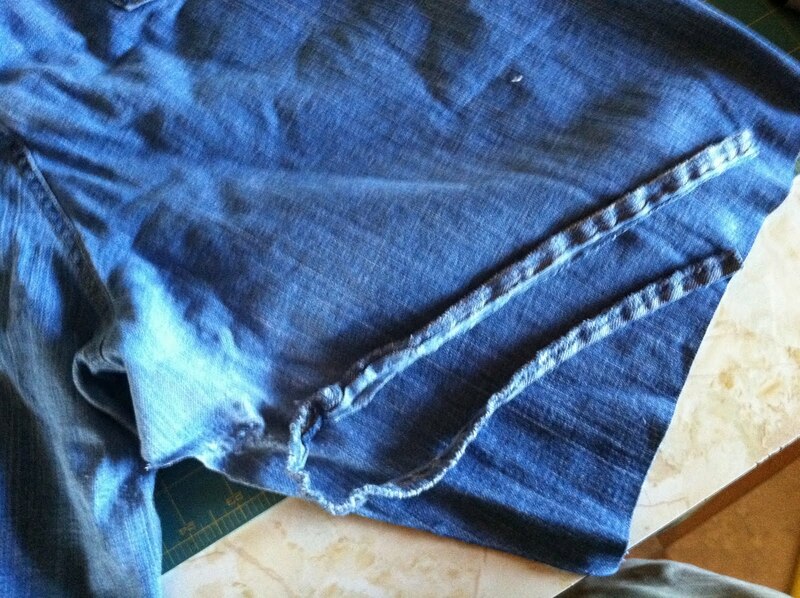 Then split the inside seam of the leg. 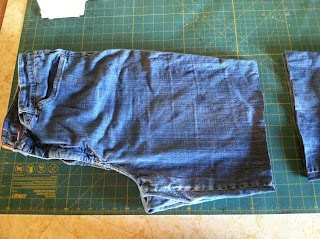 Next, cut off the inside seam of the inner legs. 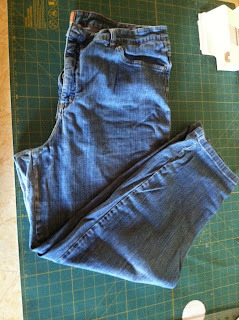 Split the back crotch up far enough so that when you lay the curve down it lays flat without any puckering. Pin in place. It's best to stitch along the seam that's already there in a matching thread color. 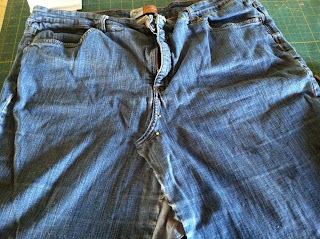 If your pants have a deep crotch you may have to split some of the crotch seam in the front and lay it flat as well. Pin it in place and stitch like you did the back crotch seam. 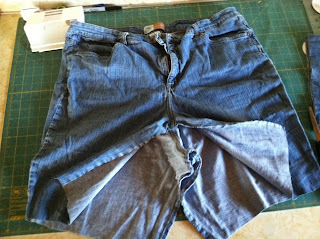 Next take your leg pieces that you cut off and open one of the side seams. 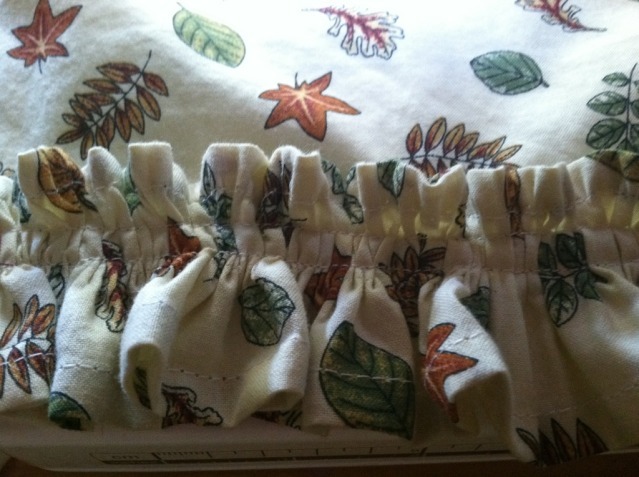 Now take it to your machine and stitch along the edges of your fabric where it's pinned. 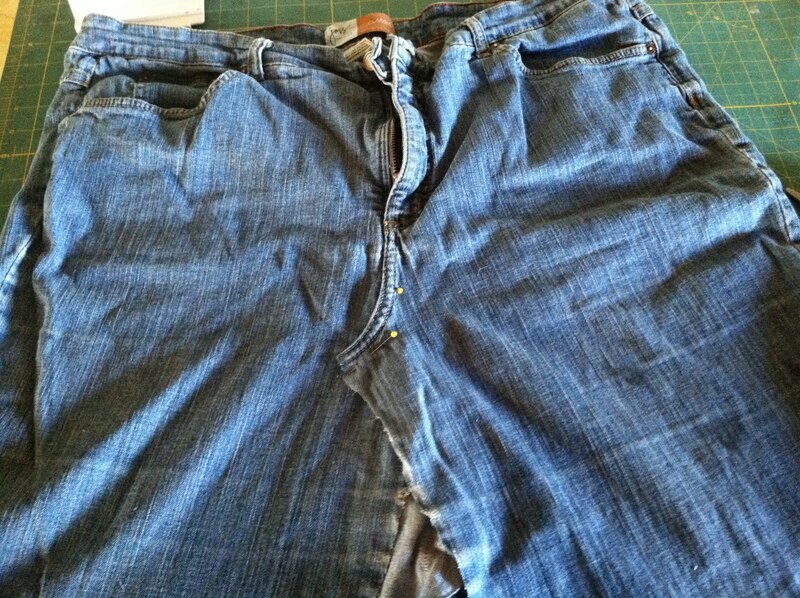 Once it's stitched you can trim off the excess fabric. 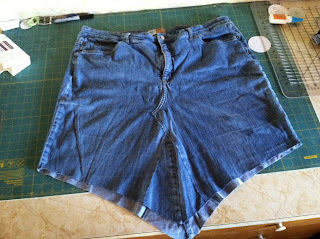 You can shape the bottom now. 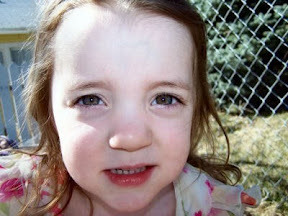 I wanted mine to come to a point in the middle and I also wanted it slightly longer in the back than the front. 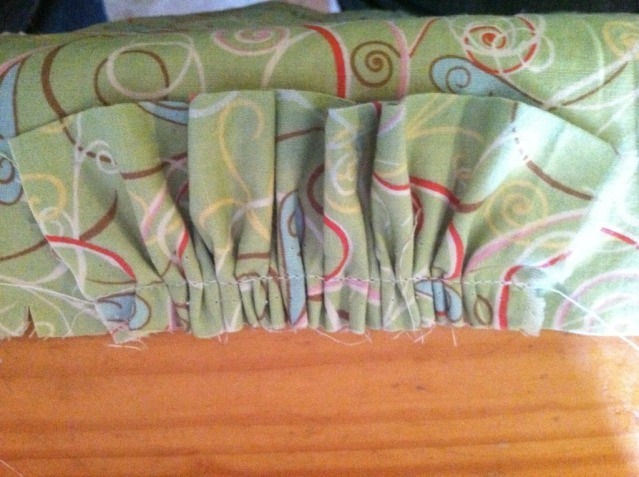 You could leave it just like this (though I would run a line of stitching about 1/2" away from the raw edge to keep it from fraying too far) or you can add a ruffle or something. I'm still trying to decide what I want along the edge of mine so I'll post a final pic when it's complete. This print is from the Heather Ross Lightening Bugs and other Mysterious things. It's out of print now which is sad. I've never loved a fabric collection quite like that one. Hopefully tomorrow we can get an action shot. She's going to flip when she sees this tomorrow. I think it's safe to say she loves it. It's one of my most hated tasks ever. 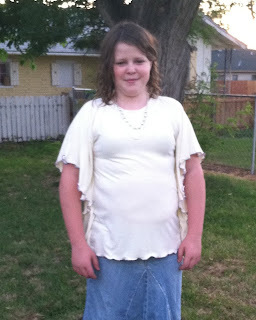 I shy away from garments with ruffles/gathers because I simply can't stand sewing them. I have a ruffler foot for my machine but can't stand it even more then I can't stand gathering. I put together a quick little tute for a friend (and my mom, Hi mom!) so that it's easier to understand a method that I found works great for getting your gathers spaced a little more evenly and keep them from getting caught in the seam like mine use to. Lengthen your stitch to the longest length and set your tension to 0 (it's very important to make sure you set your tension to 0 otherwise you won't be able to pull the bobbin thread). 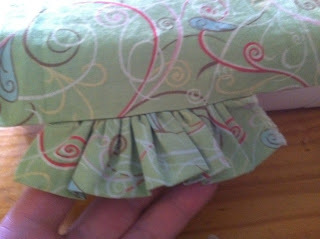 Stitch two parallel lines down the length of your gather/ruffle being sure your seam allowance falls between the two sets of stitches. 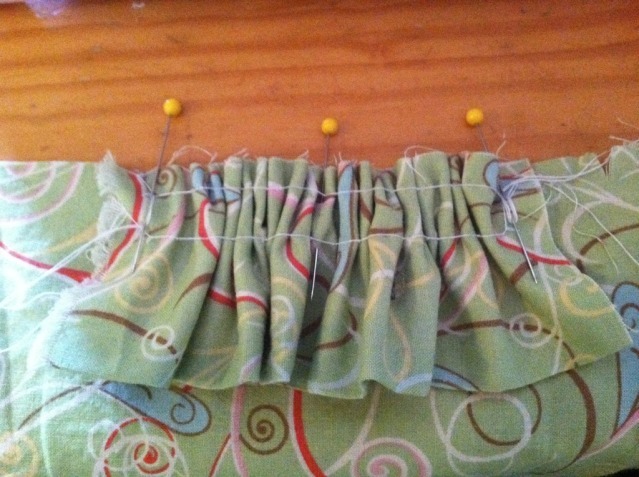 Pull your bobbin thread up gathering your fabric as tightly as you need it. Pin, pin, pin. Those that know me know how much I hate using pins but they are a necessary evil when gathering. 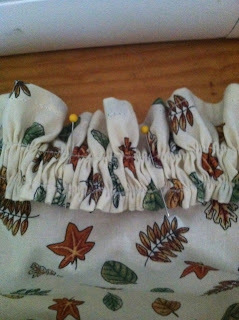 I also wrap my bobbin threads around the pins on the end to keep it from unraveling and losing the tension in my gathers. 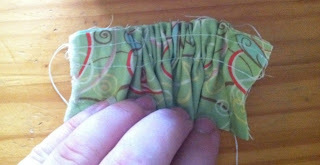 Stitch using your seam allowance and then remove your bobbin threads and the top thread will come right off. Also, when I stitch any ruffles/gathers I stitch it so that the flat side of the fabric is on top by the pressure foot and the gathers are next to the feed dogs. 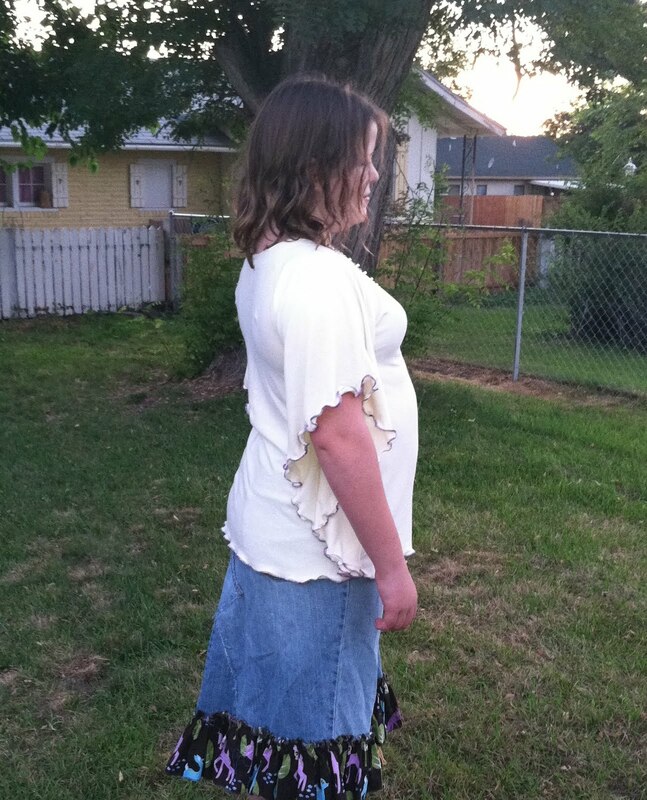 Now, there's a second type of ruffle... One that sits on top of your garment and has a cute perky ruffle at the top and a longer ruffle on the bottom. 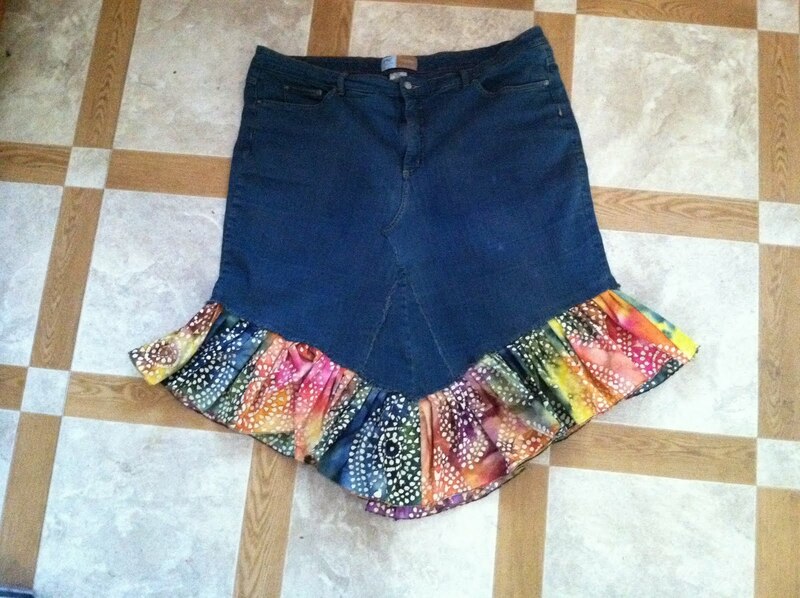 It looks really cute on the bottom of skirts. First step is to finish all of your raw edges. 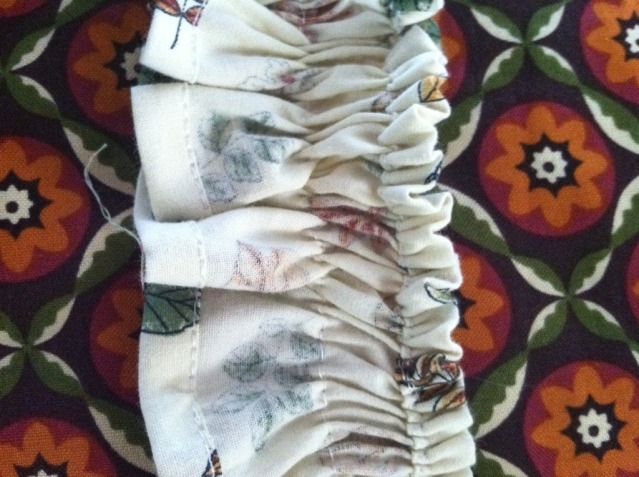 Either turn and topstitch, roll hem, or serge. 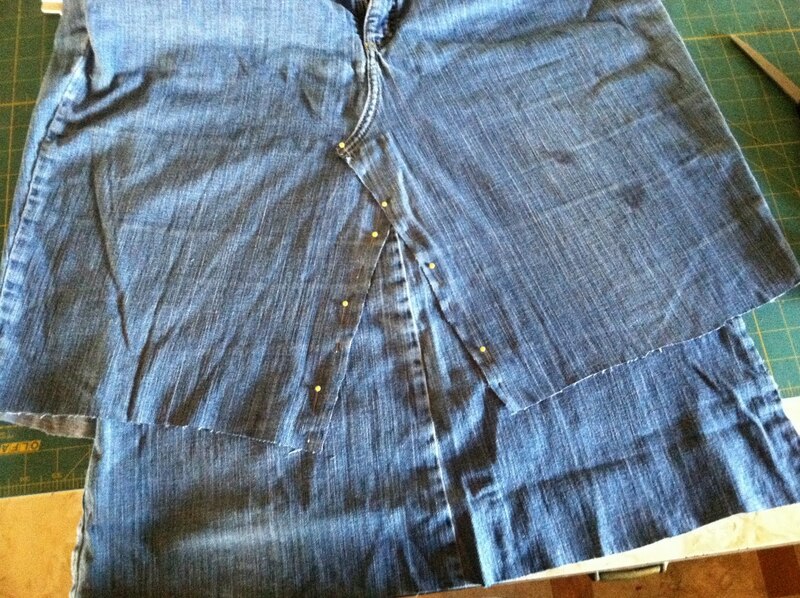 Then run double basting stitches at least 3/4" apart. Then, gather it to fit your fabric or garment. 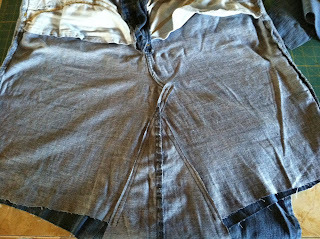 Make sure the edge of the fabric/garment you are attaching it to is finished as well. Pin it to the fabric making sure that your basting stitches line up along the bottom edge of your fabric/garment. Stitch two parallel lines making sure they fall between your basting stitches. 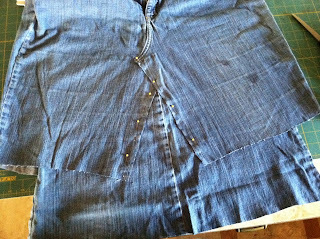 Pull your basting stitches and and here's how it should look when it's done. 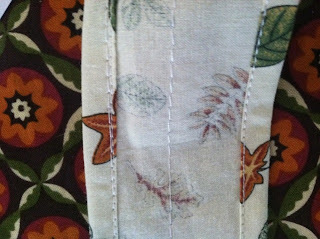 The biggest thing is to make sure that your seam allowance falls between your basting stitches. That's what will give you the nice even ruffles. I hope this is helpful for someone. It's been such a cold winter. We didn't see much of the white stuff. I'm ok with cold if there's a purpose. (IE: Where's the white stuff?) But now ya'll? It's spring. We've had lots of rain. 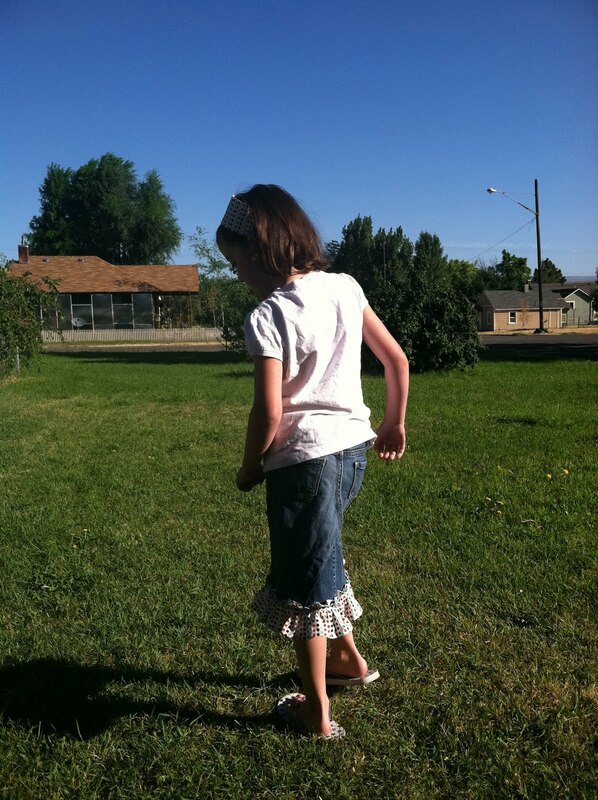 Thankfully we had a nice beautiful day on Saturday and so we went and had an Easter Egg hunt with some friends. In true "me" style, I forgot to take pics of all the kids and their loot but I did catch a few of Jake since this was his real first experience with Easter egg hunting. I hope you all had a lovely Easter. I am so happy that spring is here! I can't wait until we can do visits to the park to play. The kids only have one more month of school left. I'm sure May will be full of adventures! There are times where I remember it. I didn't realize that it had been so long since I'd posted though. :-/ The kids are doing great. Jake is growing by the day. He's no longer nursing, and I was ready to be done. I love when he wants to just snuggle me. Will is one of the most kind hearted kids I've ever had. He requires lots of mommy and daddy snuggles which we are more than happy to provide. Hannah is so smart. She got E's on all of her grades except for music (weird). E stands for Exceeds Expectations. She loves to read which is always encouraged. Michael, well, I think he's found something that he loves and really cares about! He's on the "track" team at school and loves it. He also attends an after school program where they do homework and spend time reading and doing other activities. He's improved on his grades quite a bit since 1st grade. I'm hoping that track gives him more ability to focus on his school work a little more. Abby, she's 13 now. So hard to believe that I'm a mother of a teenager! I love that girl with all of my heart. I know she has the ability to be someone who can really make a difference. She just needs to embrace it. As for me and Cliff, well we are busy parents of five of the most beautiful children on the earth. Cliff also accepted more hours and is now working full time. Sometimes the job is a little stressful but I think that's pretty typical. We also Independent Product Consultants for a company called doTERRA. Their products have made such an impact on our lives. We have such a wonderful group of people helping us to achieve our dreams and look forward to growing so much more. ♥ I hope that you all are doing well.